I'm a fan of Google Desktop's alert. This isn't a widely used feature but I love the way the primitive discovery engine flashes up alerts of news that might interest me. The alert has been wrestling with sorting the navigation from the content in the news posts though - Google News does not have this problem but Google Blogsearch, which has just moved to full feed, does. The screen grab here shows an alert from Sky News saying; "Use the drop down menu below to filter stories and video the way you want-". 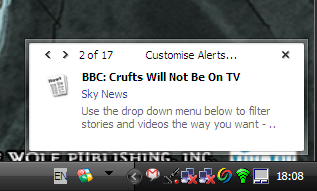 Sure; this is one to add to Sky New's SEO list but it doesn't reflect well on Google Desktop either. It shouldn't need the guiding hand of an SEO. Some people dislike it as it does use some CPU time to index your machine. My main problem with it is that it's a pain to install; you need administrator privileges and then it will only run on the Windows profile which installed it. That's more effort than most corporate IT teams are willing to go through. Google learnt their lesson with Chrome though. I upgraded Chrome with only user permissions today. Sneeze near a Google product and you'll install Chrome.